Ready for some more Pinspiration?! This month’s theme is back to school. 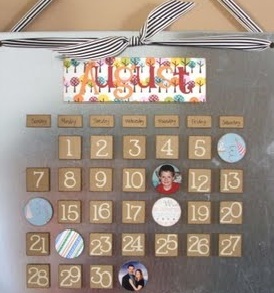 This month’s Pinspired craft: Customizable Magnetic Calendar with Custom Activity Magnets. Description: This project has two options for the base of the calendar 1) a magnetic 9″ X 14″ cookie sheet or 2) a magnetic 12″ X 12″ tin sheet. Everyone will make 31 chipboard number magnets, 7 days of the week chipboard magnets, and 12 month chipboard magnets. We will also provide a pile of embellishments for you to make a variety of holiday, activity, and birthday magnets. Attention scrapbookers: we are looking for extra paper scraps/paper pads, stamps, Cricut machines and mats, and left over embellishments. Please click on this link to register for this month’s gathering. You will receive a confirmation email within 48 hours of registering. If you need to cancel, we will make every effort to sell your supplies to others at the meeting, but if we cannot please consider paying for your materials anyway. Ready for some more Pinspiration?! This month’s theme is summer style. 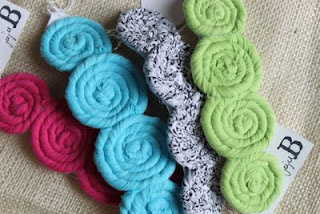 This month’s Pinspired craft: Fabric Wrapped Flip Flops and Bracelets. Description: These are all no-sew projects, they simply require braiding, wrapping and maybe some hot glue! 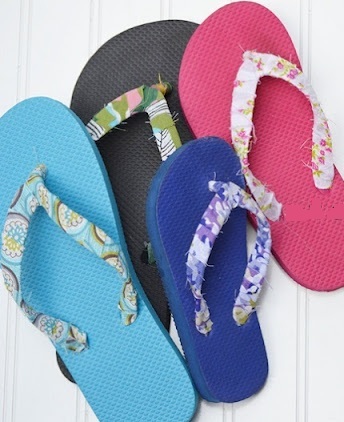 We will provide a variety of bling and fabrics for you to design your own custom jewelry and flip flops, and encourage you to bring any extra scrap fabric, ribbon and embellishments you want to share with the group.